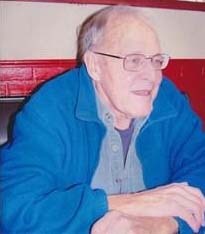 Stanley M. Sackett, 84 of Portland OR, passed away on Sunday, April 22, 2012. He was born on July 28, 1927 in Portland, Oregon to Leland and Fannie (McKennon) Sackett. He was raised in Sheridan, Oregon where he graduated from High School in 1944. He received his BA from Oregon State and his MS from the University of Oregon. He had years of doctoral study at the University of Washington but did not complete his doctoral thesis, choosing active parenthood instead. He worked as an economist for 25 years, initially for First National Bank of Oregon, which had become Wells Fargo by the time he retired in 1989. He married Lurah Slocum on August 22, 1948 in Portland, Oregon and she preceded him in death on July 1, 1988. He is survived by his daughter Jane MacKinnon and sons Jeffrey Sackett, Jonathan Sackett, Timothy Sackett, all living in Portland, Oregon, and Daniel Sackett of Seattle WA; brother Russell Sackett of Ellensburg WA; thirteen grandchildren and nine great-grandchildren. He was an avid reader, humanitarian, conversationalist and thinker; an inventive, generous, open minded, curious, philosophical, good humored, humorous person; and a good friend. He was a lifetime member of Eastrose Unitarian Fellowship. A Service of Remembrance will be held at 2:00pm on Sunday, May 20, 2012 at Eastrose Fellowship Unitarian Universalist Church, 1133 NE 181st Avenue, Gresham OR 97030. Contributions in lieu of flowers may be made to Eastrose Fellowship or Snocap Community Charities. Arrangements entrusted to Gateway Little Chapel of the Chimes in Portland, Oregon. US Social Security Administration, "Social Security Death Index", database, American Ancestors, "Lurah S Sackett, b. May 25, 1926, d. Jul 1, 1988, SSN 543-22-2950 issued OR, residence Portland, Oregon, 97236, county Multnomah." 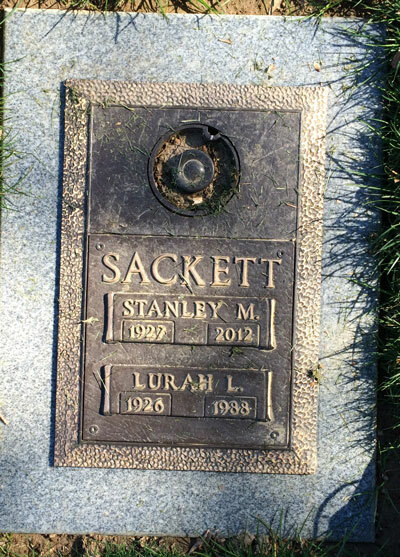 Sackett, Stanley M, son, 2 8/12, b. OR, father b. OR, mother b. AR.